Fall is a beautiful season on Northeast goat and sheep farms. It's an opportunity for farmers to experience spectacular foliage and a sharp drop in many of the parasite populations that challenge their animals over the summer. Unfortunately, it's also a prime time for goats and sheep to become infected with deer worm. The purpose of this article is to familiarize goat and sheep farmers with 1) typical signs of deer worm infection and 2) potential treatments to discuss with your veterinarian. What is deer worm? The Latin name for this parasitic worm of white-tail deer is Parelaphostrongylus tenuis. It is commonly referred to as the meningeal worm, P. tenuis, or simply as deer worm. It is ubiquitous in whitetail deer populations in much of the Northeast US. For example, samples taken from deer at processing plants during hunting season indicate that approximately 90% of the white tail deer population in the Ithaca, NY area is infected with deer worm. Deer worm has an indirect life cycle. It reproduces in its definitive host, i.e. white-tail deer BUT the immature larvae shed in deer feces MUST be ingested by the intermediate host, i.e. a land snail or slug, before they can develop into more advanced larvae (the stage 3 larvae) capable of infecting deer or similar small ruminants. White-tail deer become infected with stage 3 larvae by eating either the snail or slug or contaminated vegetation. The larvae then migrate through the wall of the true stomach to the peritoneal cavity and enter the nerves of the lower back. They migrate forward through the meningeal layers to enter the all-important gray matter of the spinal cord. In white-tail deer the larvae cause no damage at this point and return to the surface of the spinal cord in 40 days to mature, reproduce and migrate to the cranium where they lay eggs into the bloodstream. These eggs hatch into stage 1 larvae in the lungs and are then coughed up, swallowed and passed into the deer's feces. When snails and slugs crawl over deer feces in a contaminated field, they become infected. It takes about 3 to 4 months for the stage 1 larvae to develop into a stage 3 larvae within the snail or slug after which it can 1) either remain in the intermediate host or 2) get excreted into the host's slime trail. The stage 3 larvae can persist on vegetation for several days. Thus, sheep and goats can pick up the infectious larvae either from inadvertently eating a snail or slug when eating fresh forage and fallen tree leaves or by ingesting forage contaminated with an infected slime trail. Deer worm is nonpathogenic in white-tail deer and invades the gray matter of the spinal cord without causing harmful effects. Unfortunately, aberrant hosts such as goats, sheep, fallow deer, alpacas, and llamas can also commonly become infected with deer worm. The deer worm larvae are confused in these hosts becoming more active, remaining longer in the gray matter of the spinal cord, and potentially causing damage to the central nervous system. There are two typical signs of deer worm infection. In some cases the damage is to skin nerve roots near the spinal cord causing the goat or sheep to experience a constant itch in one spot. The animal may scratch or bite the afflicted area raw. Often no other sign will occur and the animal will gradually lose this itching sensation. In other cases, the neurological damage is more serious and may cause lameness, abnormal gait and even paralysis. In these cases the animal may initially drag a hind toe slightly or show weakness in the hind end particularly when turning. The animal may cross its hind legs or dog sit. Very occasionally, the infection can affect forelimbs or brain resulting in signs such as head tilts, rapid eye movements, etc. The infection can be confused with other diseases making it difficult to come up with a definitive diagnosis. Typically the animal will have a healthy appetite and maintain a normal temperature. Because the symptoms can be similar to those of rabies, it is strongly recommended that farmers wear disposable gloves when treating animals exhibiting neurological damage. There have been no controlled studies with sheep and goats comparing various treatments for deer worm. Treatments that have developed over time include the use of ivermectin to kill migrating larvae, fenbendazole to kill larvae that have passed into the spinal cord, and anti-inflammatory drugs such as dexamethazone to reduce inflammation and nerve damage. However, veterinarians suspect that ivermectin is redundant because it cannot pass through the blood-brain barrier into the cerebrospinal fluid (CSF) and fenbendazole should be effective to control both the migrating larvae and larvae in the CSF. The Cornell Sheep & Goat Program in cooperation with Cornell Ambulatory Veterinary Services has been conducting a 3 year study with 15 sheep and goat farms in a 30 mile radius of Ithaca, NY. The study is comparing two different treatment protocols for treating sheep and goats naturally infected with deer worm. One protocol includes ivermectin and the other does not. Please note that these protocols are designed for sheep and goats and are not advised for other animal species. The protocols involve the use of the following 3 substances administered daily for 5 days. 2) Dexamethasone injectable 2 mg/mL IM at 0.2 mg/kg live weight for first 3 days and 0.1 mg/kg next 2 days (1/2 cc of Dexamethasone per 10 pounds live weight for the first 3 days, followed by ¼ cc Dexamethasone for next 2 days). Ewes and does in last month of pregnancy are not to receive Dexamethasone. Instead, they will receive flunixin meglumine (Banamine®) 50 mg/mL at the rate of 1 cc/100 lb live weight (1.1 mg/kg) orally for 5 days. 3. ¼ cc of either "Ivermectin" or "Ivermectin Placebo" SQ for 5 days for each 10 pounds of live weight determined by whether the animal has been assigned to "Treatment A" or "Treatment B". One of these products is an Ivermectin Placebo and the other is Ivermectin 1% injectable administered at 0.5 mg/kg live wt. Thus far, both protocols have shown themselves to be fairly effective in goats. Of 13 goats naturally infected during the first two years of the study, 11 improved at the end of the treatment period and continued to improve, 1 was unchanged at the end of the 5 day treatment period but gradually greatly improved, and 1 was worse but gradually greatly improved and has remained productive in the breeding herd. All treated goats ended up remaining in the breeding herds or being sold as normal market animals once the drug withdrawal period had lapsed. Of 14 sheep, 9 improved at the end of the 5 day treatment period but one had to be euthanized because of complications with pregnancy toxemia and uterine torsion. 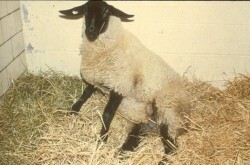 The remaining 8 either remained in the breeding flock or were sold as normal market animals. One ewe showed no improvement but lambed with triplets 3 days later and then greatly improved and remained in the breeding flock. However, 3 sheep showed no improvement or worsened and had to be euthanized. It is too early for us to state whether there is any benefit to including the ivermectin. A huge drawback of the ivermectin is that it increases the drug withdrawal period before the animals can be slaughtered for meat to 96 days for both sheep and goats. Please note, we are not advising you to use these treatments for handing deer worm in naturally infected sheep and goats. Instead we are suggesting that you use them as a starting point in discussing deer worm treatment with your veterinarian. Your veterinarian's input is necessary for the off label usage of these drugs and also to determine drug withdrawal periods for milk and meat use.